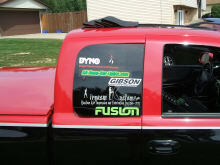 We are proud to sponsor Eric and his Dodge Dakota Truck. We at All-Neon-Car-Lights.com have supplied Eric with the very popular 2.1 Million Color changing LED Truck SUV Kit to compliment his Dakota at the car shows. 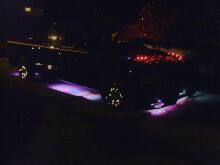 You can see a Video of this color changing LED under Truck kit in action below. Eric's vehicle is a 1999 Dodge Dakota Truck Sport V-6 3.9L. The Dakota has 1/2" air ride system all electric valves, sliding rag top sunroof, custom speaker box made for 6 10" subs 2 1000D Fusion amps, 1 600D Fusion amp, custom roll pan shaved, fiberglassed painted interior all black, 17" Detata Profilers. Just recently Eric's dakota truck was repainted red, silver and black, with the red and black having a blue pearl through it, painted door handles, painted mirrors, 12gallon air tank painted to match the truck, shaved V-6 emblems, etc. Eric has gone for the old school paint job and rims on the truck, old and new school interior, and new school suspension. This year and next year, Eric, along with his Dodge Dakota truck, will be dedicating his show season to the passing of his father Lawrence E. Gibson, in which he passed away January 23rd 2005. Eric's father loved to see him bring home trophies from the car shows, and help kids out with vehicle projects, and would also do anything to keep kids off the street and keep their minds focused on positive hobbies in life! Press "PLAY" on the video below to see Eric's Dodge in Action with the LED Under car lights! Press "PLAY" on the video below to see Eric's Dodge in Action with the Air Ride System! In Eric's spare time, time away from work, he loves to work on his new 2005 neon SRT 4, his 1999 Dodge Dakota, and other peoples vehicles doing car detailing jobs for them for a little extra cash.